Since the Summer of 2007, we have continuously noted the similarities to the late 1920s and early 1930s. 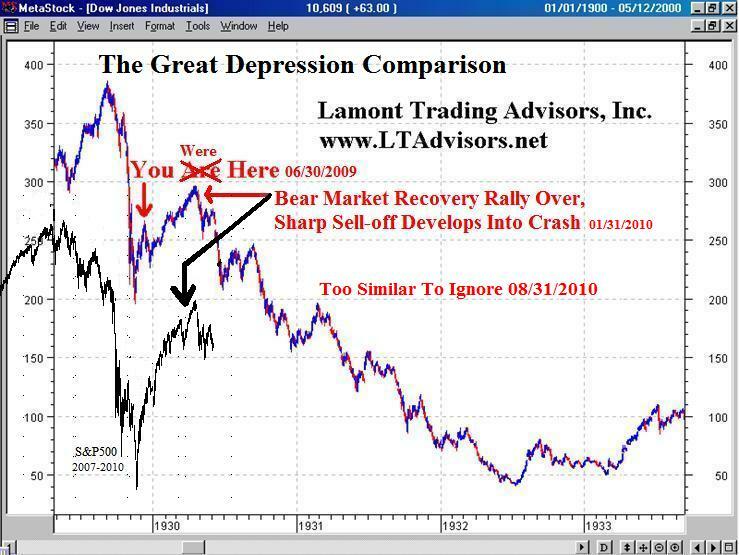 A study of financial history has given us ample warning of the credit crisis, commodity bust, 2008 Panic, subsequent recovery, and then a crash as the bear market recovery completed. Though the story has moved at a painfully slow pace, the plot line has remained true. As you can tell from the chart below, the comparison still stands. David Rosenberg, chief economist for Gluskin Sheff, and Albert Edwards, chief strategist of Societe General, are two in the industry who agree with our assessment. If History warns of a collapse in lending, then a herd of investors is likely rushing in, precisely when the prudent should be rushing out. This phenomenon should not surprise our long term subscribers. 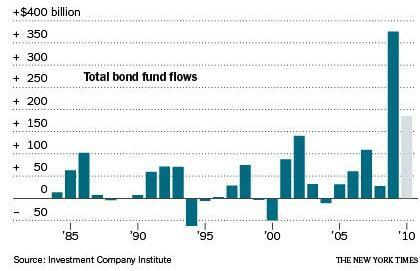 As Bloomberg reports, “investors are pouring money into bond funds similar to that of the Dot-Com mania.” And junk bonds are being issued at record pace. The chart below shows the aberration. Some stock market bulls are using the bond market bubble as evidence to buy equities. We expect rates to go up due to default risk and not because the economy or inflation picks up. Clearly, the last credit crunch was not a reason to buy stocks. We expect all bonds to lose value, even Treasury Bonds. Financial institutions were forced to sell Treasury Bonds for cash in the 1930s because they remained liquid. Rates shot up (see chart below from the Reserve Bank of Australia) and portfolio losses caused bankruptcies of financial institutions, companies, and regular folks. In our February 2008 report titled Panic Time, we were concerned with hidden bank losses. One month later, Bear Stearns had collapsed. The issue is resurfacing. CLSA’s Mike Mayo says outright that “Citigroup is cooking the books” and should be investigated by the SEC. Banking analyst Meredith Whitney also reports that banks need new capital. We should expect surprise losses from the financial sector again. Goats Head Soup, released in 1973, was recorded in Jamaica and ”reflected the resurgence of soul-pop and the rise of funk.” During the same period, investors’ mood was also in a funk. After the Paris Peace Accords were signed in January 1973, which ended the inflationary Vietnam War, the stock market fell 40% over the next two years. We suspect the winding down of another war will coincide with another portfolio heartbreaker. “For a time it seemed as if perhaps the hopeful prophets at Washington were right and prosperity was coming once more and it would be well to get in on the ground floor and make up those dismal losses of 1929. But in April this brief illusion began to sicken and die. Business reaction had set in again. By the end of the sixty-day period set for recovery by the President and his Secretary of Commerce, commodity prices were going down, production indices were going down, the stock market was taking a series of painful tumbles, and hope deferred was making the American heart sick.” – Only Yesterday: An Informal History of the 1920’s. Fredrick Lewis Allen, 1931.